Someone who is obese always tries to seek the reasons for her or his obesity. Most of us usually blame the food habits of the person for the overweight….generally the junk foods or fast foods. The obese condition cannot be pinned down to a very specific reason, but among the many reasons, one of them like the harmful effects of processed junk foods could be the main cause. There are a lot of factors that lead to obese conditions of an individual… from food habits to hereditary factors. Some become obese because of certain disease over which they have no control. But in general, obesity is caused by combinations of various factors specific to the particular individual. It so happens, even the children of the same parents living in exactly under the same conditions show a difference in body weight. Obesity is a condition where the body begins to store the excess amount of fat in the fat cells. Normally the brain with the help of leptin and insulin hormones can maintain a healthy balance of fat in the body. The modern health researchers say that the inability of the brain to regulate the fat storage in the body that makes a person obese. One of the best obesity research of our time is Dr. Stephan Guyenet, who has made great efforts to explain the role played by the brain in regulating the energy balances in the body. To put it in a nutshell, two specific parts of the brain ….hypothalamus and “Reward Center”…. play the crucial role in deciding the obesity conditions of an individual. Dr. Stephan Guyenet also explains in his video and blog how some type of foods is more conducive for promoting obese conditions in an individual than natural foods which are NOT. In human history, obesity and diabetes were not a major health issue before 70 or 80 years. In the last 50 years, period obesity has increased from 13 to 34% and severe obesity (BMI=40+) increased from 1 to 9%. That is to say, before the 1970s, the instances of obesity issues were less than 13% of the world population. Among this, most of the obesity issues were in regions specific to North America and Europe. As per some estimation, currently, over 69% of the American population is overweight. 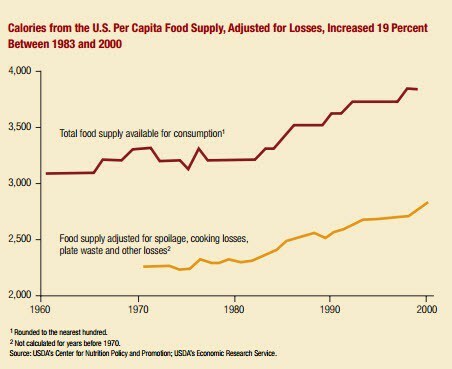 The number one reason for this massive increase over the last few decades is attributed to the changes in the food habits and lifestyles of the people. The diet of the people in general mostly consists of high calories foods. The daily intake of calories increased on an average of 360 calories per day. Let us have a look at changing the food habits of the people at length to see how they have altered the health conditions of the people living today. The hustle and bustle of modern life have left the people with little time for preparing the traditional homemade foods. For convenience sake, people have got used to the highly processed foods which are commercially made. These days, the common folk mostly are eating energy-dense, highly palatable, refined foods and red meats that are cheaper per calorie. Most of the people do not care to buy vegetables, fruits and fish (much costlier to buy) which are healthy foods with essential nutrients and low calories. 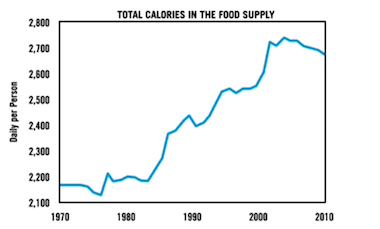 It was found there is a steady increase in the intake of high calories food (mostly the junk foods) among the American population over the past decades as income levels of the people rose. Simple and tasty home-cooked meals of the past are replaced with fast foods. The pizzas and burgers will be delivered at your doorsteps just a few minutes after a phone call, or order is made online. It is estimated that about 48% of the American population do not prepare regular meals at home; they prefer to have ready-to-eat processed foods or meals at the restaurants. Everyone will agree that the human brain is an unfathomable complexity hard to understand. The main part of the brain is the cerebral cortex where all higher level functions of the brain take place; including reasoning, calculation, and creativity. The other parts of the brain are mostly utilized for taking care of the various functions in the body; hundreds of functions from heartbeat to the slightest movement in the tip of a finger are done on auto-pilot. The hypothalamus is the specific part of the brain that controls the energy level balance in the body in unison with hormones like leptin, insulin, etc. It would have been easy for us to manage the body weight by willingly denying the unhealthy foods with the help of reasoning and logical powers of the brain. Unfortunately, the brain cortex has no control over our eating habits, appetite, and satiation. However, there are other parts of the brain that is pressurizing us to take the right decisions based on our previous knowledge of what is good for the body. The junk foods gradually alter the natural functioning of the brain centers that regulate appetite, satiation, energy level maintenance, etc. The reward centers (aka Pleasure Centers) in the brain upgrade the rewards for junk foods….which creates an insatiable liking for the palatable taste of those foods and a strong psychological drive to eat more and more of it. A strong food addiction tendency towards junks foods is easily developed and maintained by the brain centers. This makes junk foods to be a major reason for abetting obesity. As we have already seen in the above paragraphs, the hypothalamus regulates the food requirements of the body. This part of the brain is consistent tries to ensure the energy balance is maintained in the body. The hypothalamus can access the levels of fat storage (energy) in the body from the signals sent by the leptin hormone and produces the feelings of appetite and satiation accordingly. The production of leptin hormone increases with more amount of fat present in body…it is an indication to the brain that the body has sufficient long-term energy storage already in stock. When you have not taken sufficient foods, the fat storage level gradually decreases, and a lesser amount of leptin hormone is produced accordingly. The brain sees this situation as a shortage of energy deposits and quickly makes us feel hungry. The leptin hormone level also can drop quickly when the body burns a lot of stored fat to produce energy while we engage in energetic physical activities like jogging, running or any physical work. The sudden drop in energy levels makes us feel tired and hungry…it’s an instant reaction by the hypothalamus in the brain. In the case of an increase in energy storage, a higher amount of Leptin is released as number as all fat cells are full with fat….the hypothalamus reacts to it by suppressing appetite and increases the level of calories burning as well. When these coordinated functions between the brain and leptin hormone are normal and healthy a person neither starves nor become overweight due to excess fat storage. The overweight issues begin to happen when the brain gradually fails to detect the leptin levels in the blood. This particular health issue is called ‘leptin resistance’ that is one of the main causes of obesity. The fat cells in the body might be filled with a lot of fat storage… but the brain thinks it is empty because of the leptin resistance. It is good to understand the reasons that actually cause leptin resistance as it is the main culprit for obesity issues. If you have already watched the video at the beginning of this article, you can see Dr. Guyenet mentions one of the reasons for leptin resistance as inflammation in the brain. He explains this from the results of his trial studies conducted on rats, the eating of high calories foods gave rise to inflammatory cells in the brains of the rats. According to the study results, the inflammation in brain cells of the rats was increasing when fatty foods were served to the rats for seven consecutive days. This same kind of cell inflammation also can gradually creep into the human brain cells in the hypothalamus when on a regular basis extremely high calories junk foods and processed foods are consumed. The inflammatory brain cells lose the ability to sense the leptin release level in the blood; this leads to overeating and further aggravation of obesity. Dr. Guyenet also tried to feed the rats that had inflammatory brains cell with non-fatty foods…. gradually the inflammatory effects were reversed. The mice fed on healthy diets did NOT show any signs of brain cell inflammation. This study indicates the possibility of brain cell inflammation reversal in human beings too. It is possible to correct leptin resistance by adopting strictly healthy food habits. Most of the obese people are not able to shed the weights and get back to normalcy as they are incorrigibly addicted to certain foods… especially junk foods and fast foods that have so many harmful effects on health. Studies have exposed the bad effects of junk foods on the health of the body and brain. The inflammatory brain cells in the hypothalamus are the result of regular consumption of high calories processed food. The result of this brain cell inflammation is leptin resistance and increased the possibilities of stroke. We tend to obtain higher pleasures of taste when we eat our favorite foods. These foods positively stimulate the dopamine (a neurotransmitter substance) in the ‘reward centers’ of the brain…higher rewards are assigned to such foods. Junk foods are those types of foods which receive higher rewards of pleasure at the ‘reward centers’ of the brain. This makes the person addicted to processed junk foods that derive higher pleasure. Any food that gives higher stimulation for dopamine release is considered as good behavior in the ‘reward centers’ of the brain. This natural system developed is to gain better satisfaction from certain foods we eat and ensure our survival in the natural environment. The problem with packaged foods is that they have selective ingredients that induce the increased release of dopamine. Children can get very fast addicted to junk foods because their brain is more susceptible to addictive substances. The extraordinarily high rewarding characteristics of the junk foods quickly influence the brain to accept them as the ‘good behavior’ that gives greater pleasure. Some studies say that even the excessive craving for food in thoughts can make people eat more every time and get fatter…even though they are not addicted to any particular food. Various study results on this subject, which is actually done to help the people to lose weight, is exploited by the food manufacturing companies to add right ingredients that will derive more pleasures from the processed food they make and sell. Dr.Guyenet has given a piece of detailed information on why do people get addicted to junk foods and how do they badly affect our health in many ways. He is quite successful in establishing the roles played by our brain in developing obesity conditions. First of all the junk foods are causing inflammation in the brain cells that eventually leads to leptin resistance. Secondly, junk foods have chemically manipulated ingredients that influence the reward centers in the brain to reward them with higher pleasures. They also work like addictive substances to make us addicted to those foods. The healthiest food for anyone is the natural foods that have been used by our forefathers for centuries. They are low in calories, healthy and nutritious with no side effects like that of the junk foods. The natural foods hardly develop any inflammation in the brain cells, and they do not alter the natural functioning of the reward centers in the brain. Wow..this is article made great reading…packed with valuable information on reasons to avoid junk foods. Well done. Foods like frozen vegetables and fruits, canned beans, whole-grain pasta and bread, Yogurt, Jarred Marinara Sauce and Salsa, etc cannot be bad. It is bad to generalize all processed foods as bad. I am addicted to ice creams and wafers since many years. Just trying my best to get out of this idiotic craving, but I cannot resist the temptation. Reading this essay here has strengthened my desire to quit the habit. Thanks. For those who are fallen prey to junk foods, it is hard to resist this craving. It means their dietary choices are already attuned the genetic variants of natural foods in the form of processed and manufactured foods that are very unhealthy for regular consumption. The only possible ways to overcome this dangerous food habit in by changing how the brain processes junk food, changing how much people crave these foods, and even altering the brain’s dopamine system. This process of resisting the urge to consume junk food may even involve more potential treatment including using gut hormones to act on dopamine brain cells. As you have well said, the processed foods with added additives are gradually destroying the health of people these days, especially the younger generation. The bad food habits formed in children at the young age continues even when they are grown up. In most of these cases, there is a sheer lack of parental responsibility in bringing up the children with healthy food habits. Excessive attention for delicious taste without an iota of concern for the quality of the food is a dangerous trend. Great details on dangers of junk-food diet; I am happy to chime into this discussion with some of my personal thoughts on the matter. Junk foods have terrific and horrible repercussions on health. It can inflict irreversible dangerous effects on health. The junk-food diet affects muscles’ ability to oxidize glucose. This has significant adverse effect on health because muscle plays an important role in clearing glucose from your body after a meal. •	Damaging free radicals increase at an alarming speed. •	A surge and drop in insulin make you feel hungry constantly.